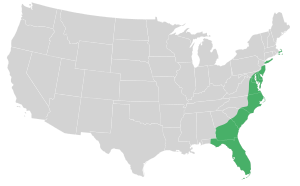 The Atlantic coastal plain covers parts of Massachusetts, New York, New Jersey, Delaware, Maryland, the District of Columbia, Virginia, North Carolina, South Carolina, Georgia, and Florida (Alabama is part of the Gulf Coastal Plain). The province's average elevation is less than 900 meters above sea level and extends some 50 to 100 kilometers inland from the ocean. The coastal plain is normally wet, including many rivers, marsh, and swampland. It is composed primarily of sedimentary rock and unlithified sediments and is primarily used for agriculture. The area is subdivided into the Embayed and Sea Island physiographic provinces, as well as the Mid-Atlantic and South Atlantic coastal plains. ^ "Generalized Landscape Regions of New York State". Earth Science Reference Tables. NYSED. http://www.p12.nysed.gov/assessment/reftable/earthscience-rt/esrt2011-engr.pdf. Retrieved 12 November 2012. ^ Stoffer, Phil; Messina, Paula. "The Atlantic Coastal Plain". Geology and Geography of New York Bight Beaches. http://www.geo.hunter.cuny.edu/bight/coastal.html. ^ "South Atlantic Coastal Plain". Archived from the original on 2009-04-24. https://web.archive.org/web/20090424093048/http://www.blm.gov/wildlife/pl_03sum.htm. This page uses content from the English language Wikipedia. The original content was at Atlantic coastal plain. The list of authors can be seen in the page history. As with this Familypedia wiki, the content of Wikipedia is available under the Creative Commons License.